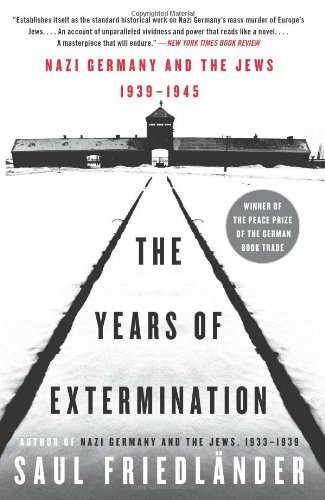 Saul Friedländer’s Pulitzer Prize winning book, The Years of Extermination: Nazi Germany and the Jews, 1939-1945, argues that the Holocaust must be understood as a European event. Without murderous German anti-semitism and racism, the Holocaust would certainly not have happened, but German policies could not have been put into practice on such a previously unimaginable scale without the acquiescence, support, even active participation of a wide range of historical actors in all of the occupied countries. However, it was the attitudes and behavior of Europeans in the occupied countries that permitted the Nazi fantasy of genocide to become a murderous reality. Many Europeans played active roles in the machinery of mass murder; the local governmental authorities in the occupied European countries who implemented the German racial laws, the local police forces who helped round up Jews for deportation to the death camps, the Eastern Europeans who functioned as guards in those camps, the ordinary Europeans who enriched themselves with Jewish property. Others simply remained silent, above all the political and religious elites. Some Europeans did resist. In Belgium, for example, resistance organizations worked with the Jewish underground to hide about 25,000 Jews. Nor did all the Jewish victims continue to follow German orders in the hope of surviving until the end of the war. In the eastern European ghettos, some Jews engaged in armed revolts. But the bitter irony of these courageous acts of Jewish resistance, such as the April 1943 Warsaw ghetto uprising, was that they convinced Himmler and Hitler to move even faster with the annihilation of European Jews so that Nazi Germany would not have to deal with more Jewish revolts. Friedländer draws extensively from diaries written by Jews across Europe during the war. Their voices help to make this a powerful book. It deserves to be read by anyone interested in the Holocaust.